In the bustling metropolis of San Fransokyo, 14-year-old tearaway Hiro (Ryan Potter) has just been persuaded by older brother Tadashi (Daniel Henney) to channel his engineering talents into robotics when tragedy throws his life into turmoil. Struggling with grief, Hiro strikes up an unlikely friendship with his brother's healthcare robot Baymax (30 Rock's Scott Adsit), the pair teaming up with friends to become crime-fighting superheroes. A manic mash-up of cutting-edge visuals and traditional narrative sensibilities, Big Hero 6 is a triumph of style and substance. In adapting Marvel's graphic novels, screenwriters Jordan Roberts, Daniel Gerson and Robert L Baird have crafted a story that stays true to the Disney moral code, but which has a decidedly modern feel. Particularly, there's no trace of coyness, the narrative unafraid to lay bare themes of loss and grief for characters to confront and overcome. The ultimate message of staying true to oneself may be familiar, but the emotional journey is raw and real. Of course, this is Disney and so these darker themes are embedded within a vibrant world full of big characters and even bigger laughs. Most of these come courtesy of Baymax, a wonderful plus-sized creation who both turns the idea of a superhero on its head and embraces what it truly means to be one. 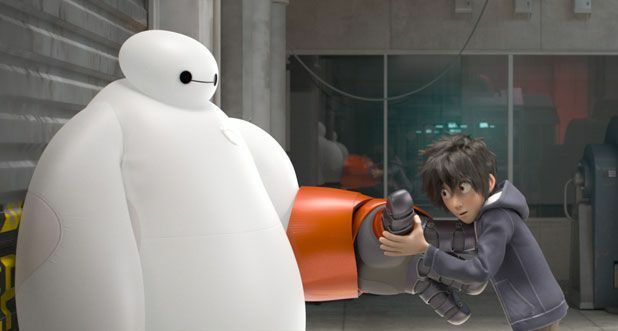 Voice artist Adsit lends Baymax a personality as charming as his looks, his delivery being by turns hilarious – a low battery stupor being a highlight – and brimming with pathos. There are other ideas at play here; the direct fusion of East and West speaking as much to global cultural and economic realities as it does to Hollywood's increasing forays into Asian co-production. Such acknowledgements – like many of the jokes – will go over the heads of younger audience members, but those classic Disney themes of love, loyalty and self-belief will surely leave their mark. General release from Fri 30 Jan.
Hiro (Potter) is a 14 year old robotics genius who, after a family tragedy, teams up with inflatable robot Baymax (Adsit) to become crimefighting superheroes. This Disney adaptation of a Marvel comic deals with dark themes of loss and grief but also has plenty of heart and some big laughs, especially from Adsit.